Hackers have supposedly managed to reverse-engineer the exclusive Apple Siri personal assistant feature that debuted in last month's iPhone 4S release. They claim the feat enables them to make the service work with virtually any device, including the competition's Android handsets. 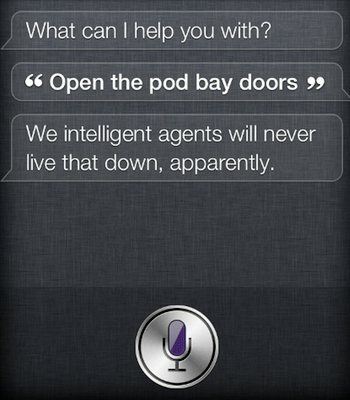 "Today, we managed to crack open Siri’s protocol. As a result, we are able to use Siri’s recognition engine from any device. Yes, that means anyone could now write an Android app that uses the real Siri! Or use Siri on an iPad! And we’re going to share this know-how with you," Applidium commented in a blog post about their newly discovered hack. The team discovered that the service requires a HTTPS connection and identified the Siri server as guzzoni.apple.com. It also required a valid certificate but they found, surprisingly, that a self-signed certificate could be used in place of the valid Apple supplied certificate. “Seems like someone at Apple missed something!”, the researchers wrote. Security protocols aside, the service works by compressing and then sending the audio to the server. The server then uses a variety of methods to validate the device is trusted, including an identifier unique to each iPhone 4S. Once this stage is complete the servers then send the processed data to the handset. As evidence of the hack, the folks at Applidium provided a recording of them trying out Siri’s speech-to-text feature (in French) and a text file with the decoded request. The sound sample never went through any iPhone, but nonetheless they were able to get Siri to analyze it. For developers and those generally curious it offers a good insight into how the service works, and more crucially, how it communicates with Apple's servers. Applidium also released the tools that helped them gain access, which will no doubt prove useful to developers wanting to integrate apps functions into Siri. However, while they did crack Siri they also realized that each iPhone 4S features a unique identifier used when connecting to the Cupertino-based servers that provide the service. So in order to hack it you would need to first purchase an iPhone4S, or at least have a willing friend hand out there unique identifier. There is yet another catch, though: Apple has stated they can blacklist any phone from the Siri service if it is flagged for excessive traffic, so finding a willing participant might end up rather fruitless. Apple has a very proactive, somewhat aggressive approach when it comes to security and exploits so it is uncertain how long this exploit will remain valid. Less than a week ago a developer was booted from Apple's developer program for demonstrating an exploit in the App Store.